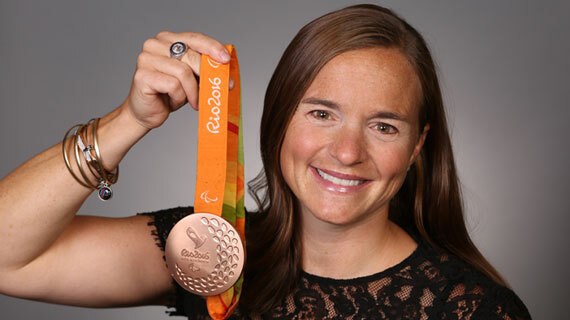 Patriot and American war hero, three-time world champion para-triathlete and Paralympic medalist Melissa Stockwell will address Southern Utah University's Class of 2019 as the keynote speaker for the University's 120th annual Commencement Ceremony on Friday, May 3, at 9 a.m. in the America First Event Center. “We're honored at the opportunity to have a military veteran and para-triathlete share her story at this year’s graduation. Melissa's compelling story about overcoming difficult circumstances and obstacles will help inspire our graduates to accomplish anything they set their minds to as they go out into the world,” said Mindy Benson, vice president of alumni and community relations. Stockwell has dedicated her life to overcoming personal tragedy by chasing greatness and giving back to others. In 2002, she graduated from the University of Colorado and was commissioned as a Second Lieutenant in the United States Army. Her incredible journey of service and triumph over difficulty began in March 2004 when she was deployed to Baghdad, Iraq. Three weeks after Stockwell’s deployment a blast from a roadside bomb struck her Humvee causing the loss of her left leg above the knee. After numerous surgeries and infections, Stockwell was medically retired from the army. However, Stockwell refused to retire from accepting and conquering challenges. Following her military career, Stockwell focused on becoming an athlete. In April of 2008, she became the first Iraqi War veteran to qualify for the Paralympics where she competed in three swimming events and was chosen by her fellow Team USA members to carry the American flag during the closing ceremonies in Beijing. She says she is proud to have served her country as a member of the U.S. Army and as part of Team USA. 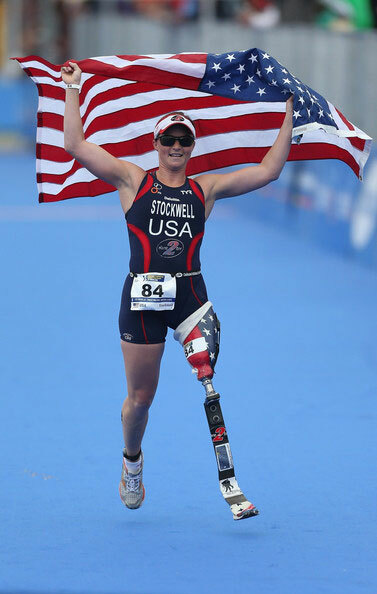 On September 11, 2016, Stockwell returned to compete in the Rio Paralympics as a para-triathlete in honor of her fellow soldiers and their families. After a grueling race, she ended the day on the podium as a Paralympic bronze medalist. Stockwell has spent many years competing in the sport of paratriathlon and is now a three-time world champion. She was named USA Triathlon’s female Paratriathlete of the Year for two consecutive years and is a two-time nominee for an Excellence in Sports Performance Yearly Award (ESPY). She recently completed her first Ironman in 2013. Giving back to those who face similar challenges, has become part of Stockwell’s mission. In 2007 Stockwell completed the prosthetic practitioner program at Century College in Minnesota where she learned to fit other amputees with artificial limbs. She also helps others with disabilities enjoy the triathlon sport as a level one certified coach and co-founder of the Dare2tri Paratriathlon Club. Stockwell’s inspiring story has been featured in countless media outlets such as People, Sports Illustrated, The Chicago Tribune, and Triathlon Magazine. She was also featured in the documentary “From Baghdad to Beijing” which chronicled Stockwell and three other wounded veterans journey from Baghdad to the Paralympics. She is currently the proud mother of two, Dallas Patrick and Millie Lynn. Stockwell will be speaking on May 3 at 9 a.m. in SUU’s America First Event Center for the 120th Commencement Ceremony.